One sees a lot more of the aliens in this edition though not necessarily in a good way, wites Sukanya Verma. When Bill Pullman famously predicted, 'We're going to live on' in his climatic speech as the president of United States, he wasn't only referring to the indomitable American spirit but Hollywood's fixation with franchise filmmaking. Having said that, Independence Day did enjoy a 20-year long standalone identity before director Roland Emmerich decided to thrust a completely inessential sequel of a tediously recycled model -- America saving itself and the ill-equipped world from intergalactic danger with a dash of token ethnicity thrown in the form of a Chinese space squadron, an African warlord and a French researcher. Back in 1996, the sci-fi disaster drama packed in enough cheese, charm and Will Smith to hold its worth in popcorn. Time hasn't diminished its photographic sheen; the technology looks pretty darn slick even today. But, in its latest installment titled Independence Day: Resurgence, the glamorous display of high-minded heroism is swapped for toothless, tepid bravado. There's no shortage of CGI-aided spectacle, a visual palette alternating in blazing hues and ghostly vigour and truly immersive 3D. Except, Emmerich's script relies on too much moronic logic and ludicrous contrivances for one to appreciate its old -fangled gusto of a done-to-death vision. 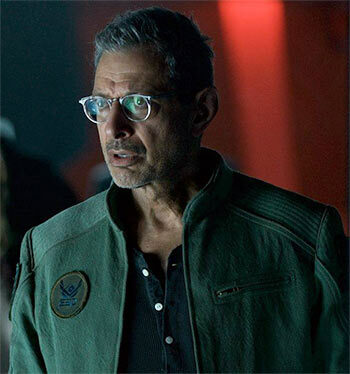 Smith's refusal for an encore is sorely missed but Jeff Goldblum as the wisecracking, flight-fearing expert on all things alien is reliably droll. "They love to get the landmarks," he adlibs as he and Liam Hemsworth (brawny boy, blank actor) glide across a barrage of alien ammo. Brent Spiner's madcap scientist wakes up from coma to reveal some more unknown facts about alien types but the only intriguing thread in the story is reduced to a puny plot point. There's also a gaunt Pullman who's no longer running the country yet receiving the privileges of one. The current president serving the space-age version of this 'unified than (haha) ever before' nation is a lady (Is Emmerich predicting the outcome of the upcoming elections?). Only it doesn't add up to anything. Nor does the obligatory romance featuring Pullman's daughter (Maika Monroe), bromance featuring Smith's stepson (Jessie Usher) or any form of sentimentality in this laughably shallow film where characters get over their deceased loved ones within minutes and waste no time in discussing housing plans or dates. A certain amount of crummy humour and corny one-liners are a given in this genre but Independence Day: Resurgence shows little creativity. One sees a lot more of the aliens in this edition though not necessarily in a good way. From shrewd control freaks engaged in absolute planetary invasion to sputtering monsters with Godzilla-sized egos, the indignity meted out at the extra-terrestrial ilk is unintentionally comic. Independence Day: Resurgence only reiterates one thing. Be it alien, superhero, monsters or natural calamity, the blockbuster factory acts on the same pig-headed formula of mindless explosion, collapsing buildings, vast amounts of rubble and everything going up in a giant ball of smoke.